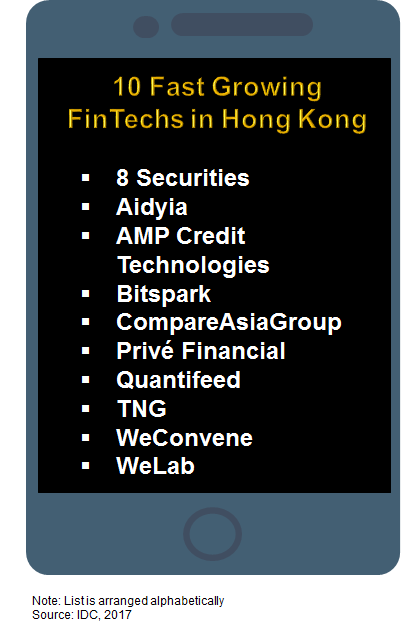 HONG KONG, October 10th, 2017 –Quantifeed is thrilled to be named as one of the 10 fast growing fintechs in Hong Kong by IDC Financial Insights as part of the broader FinTech 101 list for Asia/Pacific. “IDC’s FinTech Fast 101” refers to the fast-growing fintech players in Asia/Pacific based on extensive on-ground analysis of the dominant fintech players within the region. IDC’s fintech list makes a reference to the Financial Insights’ Triple U framework — ubiquity, utility, and usability. This is a framework that evaluates fintech data across key metrics such as addressable market, customer adoption, investments, chance of survival, innovation, and marketing. IDC Financial Insights believes that newer categories of fintechs are gaining traction, including those focused on digital identity and authentication, blockchain, cryptocurrencies, robo-advisory, credit analytics and scoring, and usage-based insurance.